After his homework, but in between music videos on YouTube, a teenage boy sits on his bed looking for something to do. Suppose he want to catch up on the day’s news. He won’t turn to the paper format his great-grandparents read, the radio programs his grandparents heard or even the evening television of his parents. He distrusts the singular voices of news authority that past generations accepted, and he consumes most of his information on his mobile phone or tablet. Newscaster lets him program news from his chosen sources, in his own time frame and in the format that works for him. American teens consume more almost 3 hours more mobile video than the general population — seven hours and 13 minutes a month in the fourth quarter of 2010; and they watch eleven hours fewer of television — 23 hours and 41 minutes a week for teens, according to June 2011 Nielsen study. Broadcast news solemnly announced the death of president John F. Kennedy, shared images of Vietnam War, showed the Space Shuttle Challenger exploding and tracked the World Trade Center towers as they collapsed. News video is still powerful way to tell important stories, but in today’s media climate, teens are more likely to watch a 90-second video of a baby dancing along with a music video than they are to watch any nightly newscast. The explosion of tablet devices from Apple, Motorola, HP and others creates an opportunity for news video purveyors. Tablet adoption is outpacing even the most optimistic projections from just a few years ago. According to BIGresearch [Copyright 2011, Prosper], 89 percent of iPad owners watch news video regularly — more than almost any other video category other than Movies. But for 18-34 year olds that number falls to 76 percent — putting it behind Cartoons and Dramas as well as Movies. In the past year, mobile traffic went from 2 percent to 15 percent of all traffic to Wired Magazine’s website, said Editor in Chief. Evan Hansen, and the iPad was the single biggest source of mobile traffic. Readers leafed through newspapers on their own choosing which articles to read thoroughly, skim or ignore. Radio and television only allowed consumers to select a station; not actually the content they wanted to listen to or watch. Remote controls for televisions and radios increased the likelihood that the public would interact to the extent of changing stations more frequently. Initially this was a linear experience; to get from Channel 2 to 5 usually meant flipping through the channels in between. Eventually remotes allowed users to entered channel numbers, but as the number of channels offered doubled and tripled in number the thousands of choices made it more difficult to switch between stations. Moreover, until the 1980s consumers had to consult a print media source to learn program availability. Eventually on-screen guides allowed users to see view and eventually switch to specific programs or record upcoming ones. But even this does not allow viewers to watch individual stories in a news show. Teenage video consumers have grown up watching individual clips on YouTube. They expect to know what story — not just what show — they are watching, how long that clip is and what related clips are available. They do not trust media professionals to produce a ‘show’ for them. Instead they pick their own video clips or watch something recommended by friends and, in turn, pass on whatever they find interesting. Newscaster offers traditionally print-focused news organizations two opportunities. First, newspaper publishers can reinvent the video-based news experience instead of ceding it to terrestrial broadcasters. By creating a marketplace for video and seeding their own videos alongside those of broadcast companies they can set the standards for quality and style. They can also convince teenage news consumers that they gather relevant news, not just produce irrelevant newspapers. Second, they can associate faces with news stories as television has done successfully for several generations. Newspaper editors, columnists or reporters could star in simple video stories that break news. Broadcast television companies like Fox, ABC, NBC and CBS have focused first on non-news video streamed online. Teenagers watch hours of sitcoms through sites like Hulu. This partnership across content providers proves it is possible for rivals to cooperate and for streaming video to attract large audiences. But the news content is presented in the form of whole shows and is not usually posted quickly enough to satisfy teenage consumers used to instant gratification. Google News is a highly trafficked news aggregator but it emphasizes text (more easily searched) over video and lacks editorial judgment in the stories presented. ESPN’s iOS radio application allows consumers to create personal filters for news looking for specific cities, teams or players but only for audio content. CNN’s smartphone app also allows users to set personalization options but only for CNN video. NPR’s smartphone and tablet applications transformed radio listening letting users program a newscast but only from a single source and only audio. Broadcast and cable news providers like MSNBC and Fox News allow consumers to watch live streamed video and individual news clips but only from a single news source. It may be difficult to convince content providers to participate. Without video from the best available news sources across a variety of topics, Newscaster will be no better than any individual news source. Nor will it compete with other aggregators like Google News, other non-news video sources or YouTube. Newscaster could share most advertising revenues — banner and interstitial video ads — with the content creators. Video creators would also have access to analytics about usage of their content — how many users, from where, what and how long they watched and, if known, basic demographics about the users. 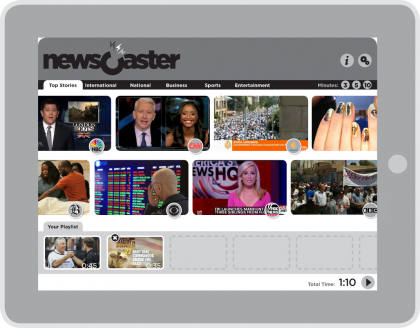 Newscaster presents a menu of timely video news stories (weather, sports, crime, education, etc.) from varied sources (ABC, CNN, Fox, ESPN, E!, etc.). The home screen encourages users to begin building a playlist but users can also select a single story to watch. Each video story lists its length and its creator’s logo. As the user drags stories into Newscaster’s timeline, the clock reflects the total length of their newscast. Users can rearrange stories by dragging them around on the timeline. Or stories can be removed from the timeline by pressing and holding them until an ‘x’ appears in the in the top-left corner. When the user is ready to start watching their newscast they just touch the play button in the lower right hand corner. The screen will dim and a full-screen newscast will begin. The user will see a short pre-roll ad, four to six seconds, followed by the stories they selected. If the newscast is longer than five minutes there will be one six to 12 second ad in the middle. And if the selected newscast is longer than ten minutes, the user would see a pair of ads evenly spaced out during the stories. There are also three auto-generated playlists each with a different fixed length: three, five and ten minutes. Each fast paced newscast includes stories selected based on past use — if the person has used Newscaster previously. Or as a person repeatedly uses Newscaster, the program will suggest stories based on past use.